The story is told from the points of view of three teenagers: Alina, a rebel, Bea, a poor girl, and Quinn, a rich guy who is the Pod Master’s protégé. Alina steals some cuttings from the rich area’s gardens to give to the group of rebels called the Resistance, and her friend and fellow rebel, Abel, is killed. Alina flees the pod to the Outlands, with the help of Quinn and Bea, who she meets at the exit. The group comes across an old lady called Maude, who had been living in the Outlands by herself. Shortly after, the group is separated, and Quinn is thought to be dead. Obviously he isn’t, but still. Alina, Quinn, and Maude steal a tank from some soldiers, and make it to the Resistance’s hideout, where they are growing trees and learning to breathe on little oxygen. Quinn runs into Alina’s cousin, Silas, and after a short journey during which they lose Silas’ boyfriend, they reach Resistance HQ and are reunited with their friends/family. Petra, the leader, is initally annoyed about all these newbies turning up and at Alina for starting a war, but Silas comes up with a plan to fight back. Quinn and Bea go back to the pod while Alina and co. gather people to fight. Quinn gives a public speech about how the government is lying to them and overfeeding them oxygen. The people start to fight back, and the Pod Master is killed. Bea flees the pod, and Quinn is saved by his father. They meet up, and find Jazz, and go to find Alina, Dorian, and Silas. Alina and Abel are stealing cuttings from the pod. They’re both part of the Resistance. Their plan goes wrong when Abel fails to take out the security camera in the first try, and they have to run. They did get the cuttings, though. Petra is excited because she thinks she’ll get promoted. Abel goes missing. Bea and Quinn are taking an exam in debate. This exam will determine their futures, and Bea could potentially become a Premium. Bea thrashes Quinn, and starts talking about how important trees are. Later, she received a letter telling her that her candidacy for the Breathe Leadership Profram has been terminated. Quinn, being a rich Premium, passes the exam. He’s in line to become the next Pod Minister. The residents of the pod are being vaccinated for green flu. Alina tells Quinn that the vaccines are poisonous. Quinn is attracted to Alina. Abel is found dead. Alina has to flee the pod, or she’ll be found out. Old Watson, her neighbour, helps her out. Quinn invites Bea to go camping in The Outlands. They meet Alina at border control, and Quinn gives Alina Bea’s pass so that Alina is less likely to be questioned. They make it through after bribing one of the security guards. Bea comes through shortly after, having had to queue up in the auxiliary line. Alina tells Quinn and Bea that she is part of the Resistance. She leaves them, but Quinn and Bea follow her to make sure she’s okay. Alina enters a house, and Quinn and Bea decide to follow her inside. Inside the house, Alina runs into an old woman called Maude Blue. Maude steals Alina’s breathing apparatus, because her own one isn’t portable. Quinn and Bea save Alina and get the breathing apparatus back, and Maude begs to be taken with them. She doesn’t want to die alone in the abandoned house. Alina agrees to take Maude along, after some persuasion from Bea. They start towards The Grove. Maude used to be a citizen of Breathe. She used to go around killing anything living that they could find, under orders from the government. 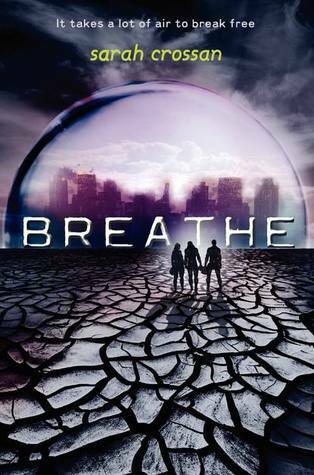 It’s revealed that in Breathe, the citizens are being given thirty percent oxygen. They’re overfeeding them so that they’ll become overly reliant and addicted. Apparently in Russia they are managing to survive on thin air. The Russians have trained themselves to be able to do this, and the pods there are almost empty. The group comes across a group of Ministry Officials. Bea, Alina, and Maude manage to sneak off, but Quinn almost gets captured. The building collapses on top of him, and he gets trapped. Alina, Bea, and Maude go underground into one of the old Death Stations, where Maude used to work as a nurse. They used to kill people in the Death Stations, to put them out of their misery. There is no way up out of the Death Station, so they are trapped. Maude’s air is running out, so Bea shares her tank with Maude. Silas, Alina’s cousin, and Inger, who are both part of the Resistance too, come across Quinn and rescue him from the rubble. Silas initially wants to send Quinn back to the pod, but eventually agrees that Quinn can tag along with them while they look for Alina. Helicopters fly overhead, and Inger, Silas, and Quinn need to run inside a building and use snow to lower their body temperatures. The Zips detect heat. In this scene, we also discover that Silas is hot. I am just sayin’. In the tank, the women are doing the same thing. Since Quinn is running out of air, Silas tries to reduce the air density in his tank. Quinn can’t handle it, though, and so they have to leave Quinn behind in the building. Alina, Bea, and Maude reach The Grove. It takes ages for someone to answer the door, because the members of the Resistance are currently hiding due to the Zips that were flying overhead. While they’re waiting, Bea collapses because her oxygen has run out. From the window of the building, Quinn sees a group of soldiers coming towards Silas and Inger. He tries to warn them, but they can’t hear him. The soldiers spot Inger, and take away his air tank so that he suffocates. “I can’t save you. I doubt I could help you even if you were my own son.” Harsh. Quinn’s father is the general, meaning he’s in charge of the army. Bea wakes up in The Grove. Alina had saved her life by using the “one breath for you, one breath for me” technique. Bea goes to see the trees and plants that have been grown in The Grove. She meets Dorian, who is walking around without an air tank. Bea and Maude are put into a prison cell. Alina takes Bea out to get food, and to show her the training rooms, where people are training themselves to breathe on little air by relaxing their bodies and reducing their heart rates. Bea meets Petra. Alina tells Bea that she should be looking angry rather than sad, so Petra knows that Bea will be useful. Bea takes food back to Maude. Silas and Quinn arrive at The Grove. Petra is obviously angry. Silas comes up with a plan to save everyone from the soldiers. Maude is washed and fed. Quinn and Bea go back to The Grove while Alina and Silas and Maude recruit drifters to become Resistance fighters. Quinn and Bea are shoved into an interrogation room. They’re questioned by the Pod Minister and Quinn’s father. Quinn tells them that the Resistance is based in the south. Quinn’s father tells him that he can’t hang around with Bea any more because she is an auxiliary. Alina and co. round up about seventy drifters. In the pod, Quinn and Bea have been practising their breathing methods and exercising. Meanwhile, Quinn’s parents have arranged for Quinn to date the Pod Minister’s daughter, Niamh. Bea goes looking for Alina’s aunt and uncle. Quinn has to do a press conference for the Pod Minister, where he is meant to say that the Resistance are terrorists and all that nonsense, but instead he tells them that the government have been lying to them, and giving them too much oxygen. He tells them not to trust the Ministry. The people rise up and start to fight, killing the Pod Minister in the riot. Quinn gets arrested. Soldiers advance on The Grove. The Resistance members have to flee, but Petra refuses to leave the trees. “She says she won’t let the trees die alone.” Silas comes face to face with Quinn’s father, General Caffrey, and Caffrey tells Silas to run. Bea flees the pod, because the Ministry is about to start pumping halothane gas into the pod to knock everyone out. Old Watson and Silas’ parents help her. General Caffrey is sent in to deal with Quinn. He lets Quinn go, and wishes him luck out there in The Outlands. Quinn and Bea meet up at The Grove, which has been destroyed. They find Jazz under the rubble, still alive. They head west to Sequoia to find what is left of the Resistance. Alina, Dorian, and Silas are on a boa on the ocean. Breathe – The pod where everyone lives. It’s run by the Ministry. People have to live here because there’s no oxygen on the outside. The Outlands – Outside the pod. Nothing grows here. Premiums – Rich Breathe citizens. Auxiliaries – Poor Breathe citizens. Drifters – People who live in The Outlands, who have most likely been exiled from Breathe. The Resistance – People who are fighting back against the government. They are training themselves to live outside the pod, and are growing trees and plants. The Switch – When people switched from living outside to living inside the pods. The Grove – Resistance HQ. Thanks so much! I am reading Resist right now and was having a hard time trying to remember what happened. This has been the most help compared to everything else that I have looked at, thank you! What might the themes be for this book?